Most people wouldn’t know that some of the biggest organic potato fields in Finland are growing organic starch potato for the world market. As you can see elsewhere on organicpotatostarch.com potato starch has a wide range of applications. But it all starts in the field with planting the potatoes. 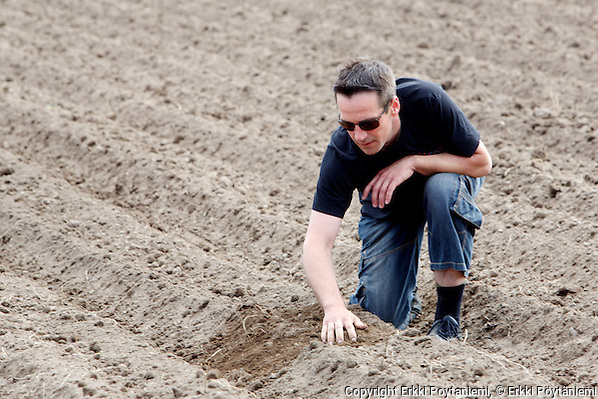 Finnamyl Cultivation Manager Kimmo Pusa checking the planting. The potato year starts with the seed potato taken out of the cellars for sprouting. It is good to have proper sprouts on the potatoes when they are planted although not necessarily so long as in the photos taken here. Starch potatoes are specific varieties which are chosen for their high starch content. A few years ago there was even plans to introduce Gmo-varities of starch potatoes in Europe but fortunately this threat was avoided because of fierce opposition from European consumers. The Gmo-variety didn’t advance further than a few test plots. Last week we were able to join the workers at one of Finnamyl’s contract farmers. This is not your typical Finnish farm because it is actually a jail. Because of the warm spring in Finland this year the last plantings were done that week. We had agreed to meet the Cultivation Manager from Finnamyl Ltd Mr Kimmo Pusa at the jail gate and proceed from there to the jail’s fields. The fields of Satakunta jail are actually old lake bottom. The water is still pumped out of the field into neighboring Kokemäki river. If it happens to be a dry summer the water can easily be drained back through the field’s drainage system so drought is not a problem here. The lake was dried already in the 1930’s and finally in 1944 the fields were taken into cultivation. The jail – like other jail farms in Finland – went organic in the 1990’s. It was felt that by going organic the jails would not compete with ordinary farmers. So the Farm Managers of Finnish jails made a study trip to central Europe in the 1990’s to see how big farms are farmed organically in those countries. And they did get a lot of ideas and inspiration. Now the farm has beef cattle of roughly 300 heads; suckling cows with calfs and young cattle. One of the herds was next to the potato field. The foreman Erkki Lahtinen tells us that the farm employes about 20 prisoners while we are watching the work. Naturally we can not photograph the “customers”. But they are calmly and expertly handling the big machines and the big bags with the seed potatoes. The day is nice wand warm and the atmosphere is relaxed. Two men handle the planting machine and one is harrowing the field before planting. There is no lack of work force at Satakunta jail. Rather the aim is to employ as many men as possible in the field work. So both potatoes and the cattle are well cared for. 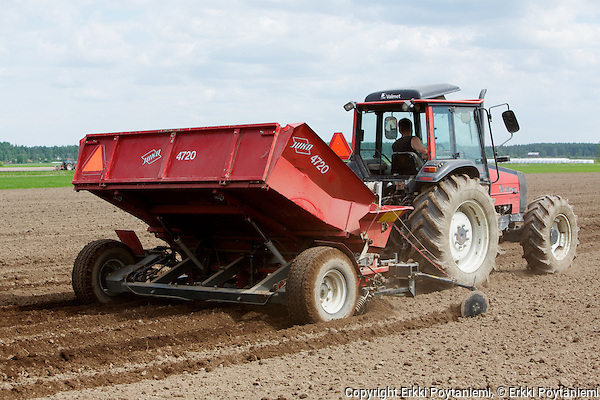 The potato rows are harrowed for weeds several times during the summer. During calfing time the workers have taken turns 24/7 to take care that everything goes ok with the cows and calfs. 2-3 men take care of fencing through-out the summer. Some of the prisoners are very skilled farm-workers. The neighboring field where the potatoes were grown last year is now plowed for barley. Most of the fields are clover lays or pasture. Also some other speciality crops like spinach and cabbage are grown although this year there will be no cabbage. Now there is actually no alternative to organic farming here as the farm is situated in a Natura protection area. The jail is surrounded by the Puurijärvi-Isosuo National park from 3 sides. Next to the field there is a bird-watching tower with a map of the area and we go there to have a overview of the area. Also the tower as well as the dams have been built by prisoners. The tower keeps eager ornithologists put where they are allowed to be without them running around the jail area. “No tresspassing” signs can be seen in many places when we drive away. In one small junction there is Highland cattle on the pasture next to the houses of the open prison. We stop to take a few photos from the road and then leave the jail. The following week we contact the Farm Manager Erkki Saari to check some details. Right after our visit there were heavy rains in that part of Finland and the potatoes got 70 mm of rain – which is clearly too much. Let’s hope that the good drainage will save the potatoes. We plan to pay the Satakunta jail another visit in the end of June and find out how the potatoes are growing. ‹ Who invented potato starch?